Get inspired by the traditions of the Philippines this holiday season! Researching, both online and offline, is a skill your student will find useful in any class. This writing worksheet gives her an interesting topic to research. In this great grammar lesson, your students will play a fun game of ad-libs before writing their own action-packed story! 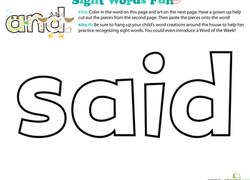 If your preschooler's reluctant to learn to read, check out this cool blend of coloring, cutting, and pasting to expose him to the sight word "see." Introduce your child to words that start with B through alliteration and this fun coloring worksheet. This pretty coloring page gets in some letter recognition practice that focuses on the letter V.
Your students will have fun developing the setting of a story with this graphic organizer. 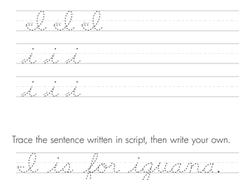 Kids practice writing capital and lowercase "I" in cursive on this third grade writing worksheet by tracing the letters, then writing their own. Get to know grandpa a little better with a fun interview exercise! Your beginning writer will practice building sentences and using descriptive language. What would you get Hedgehog for his birthday? Enjoy a fun story starter with your budding author, a great way for her to exercise her creativity. Xylophone begins with the letter X! Color in the flashcards featuring the letter X then cut them out and use them to play memory and spelling games. Share a classic Christmas poem with your little one. She'll get to color illustrations to The Night Before Christmas as she reads along! What kinds of games would you play in the jungle? Give your little monkey a fun way to practice her storytelling skills with this story starter prompt. Can you tell the difference between fact and opinion? Give your student a hand with basic logic, and help her decide what kinds of statements these are. Your students will love using this wacky worksheet to practice identifying and reading short vowel word families. Help your kindergarten students identify the main topic and key ideas in nonfiction texts using this fun pet-themed worksheet. 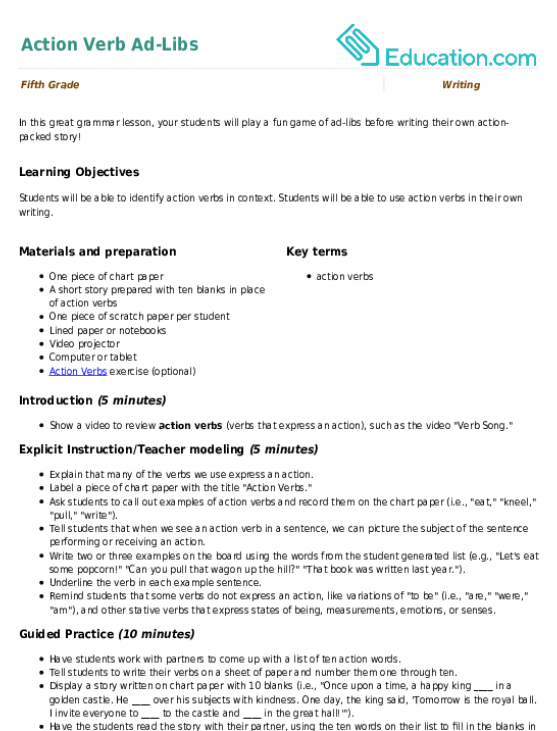 Learning about text features, such as Table of Contents, is an important part of learning how to read. 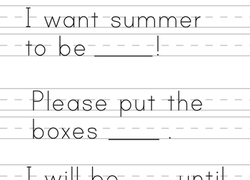 Help your child learn the sight word "here" with this printable phonics worksheet. 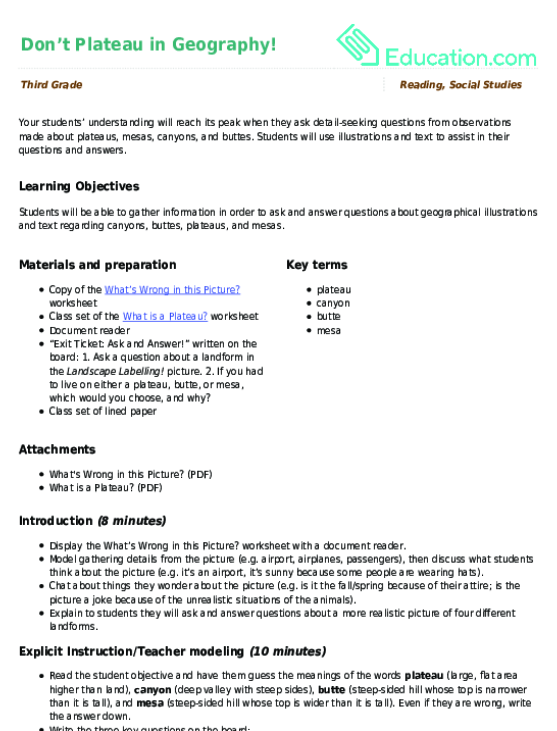 Your students’ understanding will reach its peak when they ask detail-seeking questions from observations made about plateaus, mesas, canyons, and buttes. Students will use illustrations and text to assist in their questions and answers. Color squirrels in the shape of the letter S to make alphabet learning fun! "The Scarlet Flower" shares many similarities with a famous Western fairytale. Can you guess which one? With this worksheet students will explore word associations that include suffixes. Just step outside and take a good look around/ You’ll certainly see that equal groups abound. Catch him if you can! In this St. Patrick's Day lesson plan, students will write about what they would do if they caught a leprechaun. They will also create their own leprechaun doll that they can hide somewhere in their home or classroom. Does your child need a head start in creative writing? Give her this story starter worksheet, and she'll help Marnie figure out how to bake her muffins!